My month as the September guest designer has ended, so now I am a "player" again for the weekly MDS MONDAY BLOGSPOT challenges! This week, we were challenged to select one of the Stampin' Up! MDS templates, and customize it. When I started learning to use MDS, the first thing I did was take a template and play around with changing the colors and elements. Even though one might say I've come a long way since then, using a template as a starting point is still a great way to approach designing a layout or card and I recommend it to everyone. Why not play along with this challenge today before the cutoff for entering tomorrow morning? 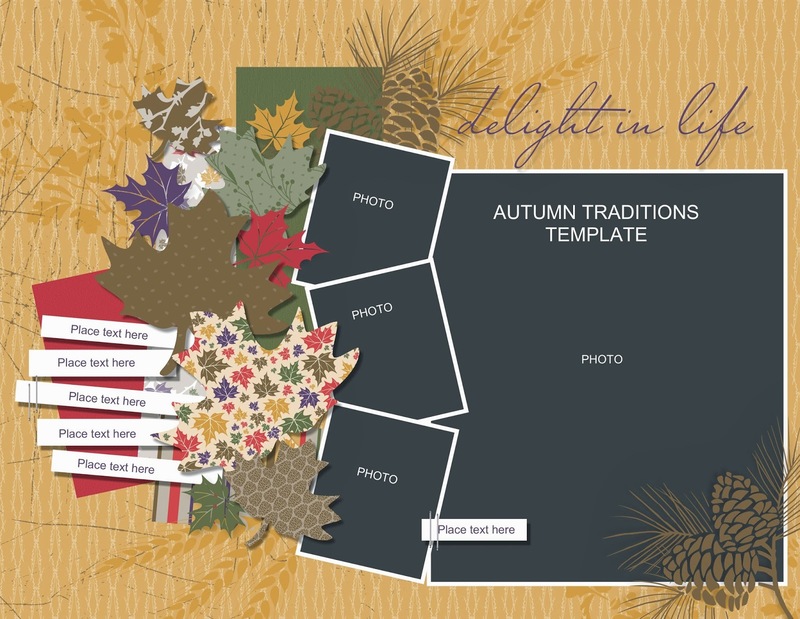 I love the patterned leaves, layers and colors of this template and if I were to create a fall-theme page (or page for framing) I would use it! It is a snap to drag and drop photos into the photo boxes, and replacing the text boxes with journaling. My challenge, however, was to customize this template. 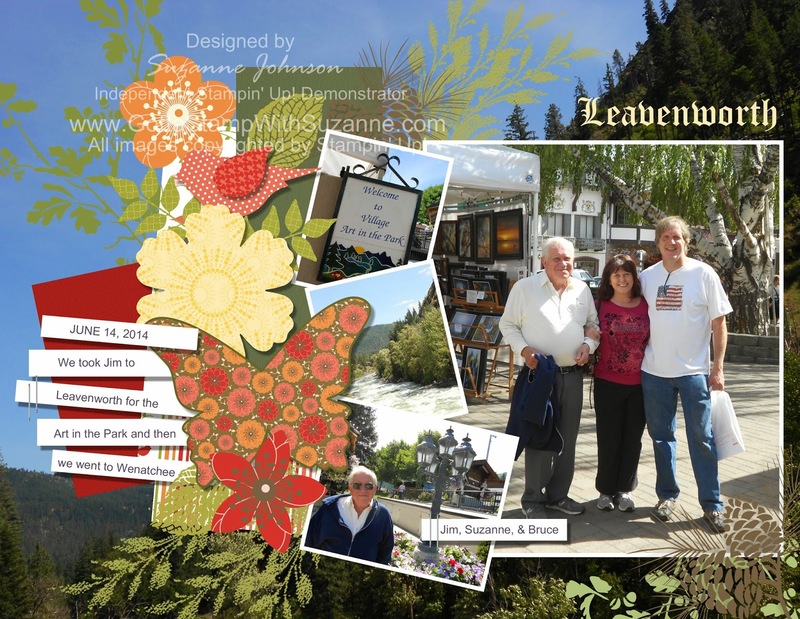 I wanted to use photos from a trip to Leavenworth, Washington my husband, uncle and I made in June. Leaves and pines certainly work for that mountain town, but not the season since it was the end of spring. So, I kept the layout of the layered elements, but swapped the leaves for flowers, a butterfly and a bird! I used punches for punches and stamps in place of stamps, and kept the sizes nearly the same. I switched up the golden wheat stamps for green leafy branches. I kept the pinecone stamps, but shrunk them down a bit. The layering tool was a big time saver in keeping the original layout while I replaced the elements. I had a system: I created a new element to replace one of the original ones, laid the new one on top of the old (without changing anything about the position or layer of the old), did any final tweaking such as size and rotation angle, then went into layering and moved my new element just behind the original/old one. Once the new one was exactly where the old was, I deleted the old one. DSPs (filled punches): from "Sun Garden" and "Domestic Goddess"
Super cute scrapbook page! I love how you changed the leaves to flowers and butterflies! Thanks for joining us at MDS Monday. I love how you changed up the template with flowers, butterflies, and birds. I knew the template, but did not recognize it at all from your sample. Great job! Thanks for joining MDS Monday this week.